Perfect for weddings and parties, when you need to ensure there’s enough ‘lovely stuff’ for everyone to enjoy. We can deliver between one and six Party Size Clotted Creams by courier within two working days. 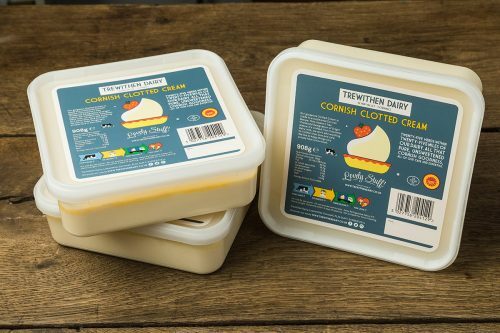 Our delicious Cornish Clotted Cream is crafted from Trewithen Dairy milk, we don’t add anything to it other than love and care. We like to keep things very simple here in Cornwall. Due to the perishable nature of the contents we are unable to deliver to the following postcode areas: AB14 – AB56; FK19 – FK21; GY; HS1 – HS9; IM; IV; JE; KA27 – KA28; KW6; KW15 – KW16; PA20 – PA78; PH15 – PH26, PH 32, PH42 – PH50; PO30 – PO39; TR21; ZE1 – ZE2 and all Northern Ireland postcodes.